In a finding that may help scientists better predict sea-level rise in a warming world, Brown University researchers have found an underappreciated factor that controls the rate at which Greenland's ice sheet melts. 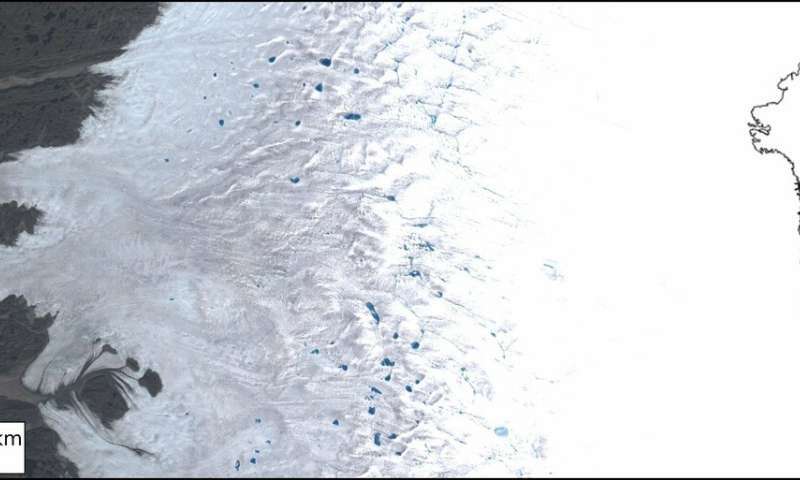 The research, published in the journal Science Advances, used satellite imagery to track the movement of the ice sheet's snowline—the elevation above which the surface is snow-covered, and below which bare ice is exposed. The study showed that snowline elevation varied significantly from year to year, and that its variation exerted an outsized influence on the amount of solar radiation the ice sheet absorbed. Changes in snowline elevation from year to year explained more than half of the annual radiation variability on the ice sheet, the study found. "People who study alpine glaciers have recognized the importance of snowlines for years, but no one had explicitly studied them in Greenland before," said Laurence C. Smith, a visiting fellow at the Institute at Brown for Environment and Society (IBES) and a study co-author. "This study shows for the first time that this simple partitioning between bare ice and snow matters more when it comes to melting than a whole host of other processes that receive more attention." The results have significant implications for predicting future sea-level rise, the researchers say. Meltwater from Greenland's ice sheet is a large contributor to global sea levels, and this study shows that regional climate models used to predict future runoff often predict snowlines inaccurately. "We found that models don't reproduce snowlines very well, which adds an uncertainty to future projections," said Jonathan C. Ryan, a postdoctoral researcher at Brown and the study's lead author. "But now that we've shown how important the snowline effect is, and have some direct observations of snowline positions, hopefully we can improve these models going forward." The reason that the snowline is so important has to do with the difference in reflectivity between snow cover and bare ice. Snow is extremely bright and reflects back into the atmosphere the lion's share of the sunlight it receives. Bare ice is much darker, and therefore reflects less radiation. Instead, more radiation is absorbed, which heats the ice and leads to melting. These processes have been well understood by scientists for years. 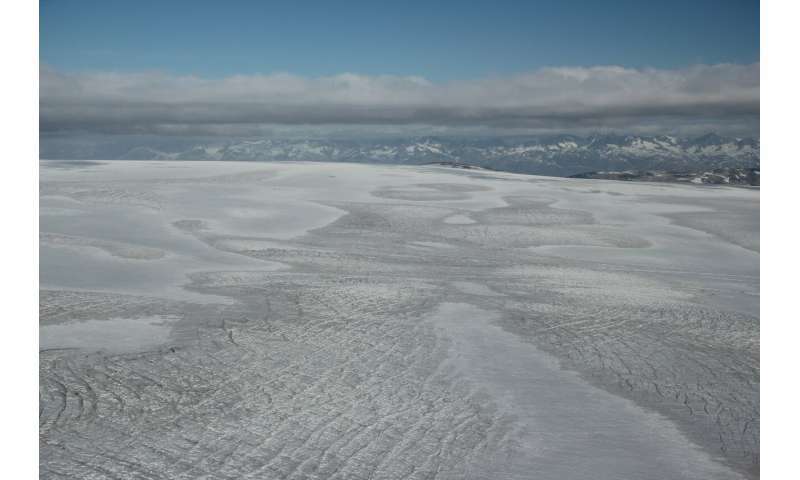 What wasn't known was the extent to which they play out on the Greenland ice sheet, and to what extent snowline migration might regulate melt from year to year. "Suddenly the snowline was just gone," Ryan said. "In a couple of days it had moved 30 kilometers or so up the ice sheet and was now out of the range of our drones. That was the first moment we thought we should investigate the effects of snowline movement on melt." For the study, Ryan and his colleagues used images from the MODIS instrument, an imaging spectroradiometer that flies aboard NASA's Terra satellite. They were able to get a time series of snowline positions from 2001 to 2017. They could also measure the reflectivity of both the snow cover and bare ice. The images confirmed a substantial movement of the snowline from season to season and from year to year—reaching a maximum elevation in 2012, a record year for ice sheet melt. There was also a substantial difference in reflectivity between the snow and ice. The snow reflected an average of about 79 percent of the radiation that struck it. The ice, meanwhile, reflected only between 45 and 57 percent. The snowline movement combined with the differences in reflectivity mean that snowline position plays a dominant role in controlling the ice sheet's energy absorption. All told, 53 percent of year-to-year radiation variability can be explained by the position of snowline, the researchers found. "That's a surprise because there's been a lot of work lately on these ice-darkening processes," Smith said. "It turns out that in this case, we were missing the elephant in the room, which is the snowline." Having established the importance of snowline in energy absorption—and ultimately in melting and runoff—the researchers wanted to see if regional climate models properly captured the effect of the snowline. That's important because those models are used to predict future runoff from the Greenland ice sheet. Given the importance of snowline position as revealed in this study, the researchers say it's important the models get the snowline right. "We're collaborating now with the modelers, providing them with our observed snowlines," Ryan said. "That gives them some ground truth they should be able to use to adjust their models. Now there's something to aim for." The result of those improvements in modeling snowline, the researchers say, would be more accurate forecasts of Greenland's future contributions to sea-level rise. Its seems reflectivity or albedo is very important, when it comes to ice sheets, did the Iceland volcanic eruptions play a role here? Ash darkening the snow?